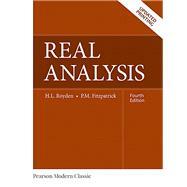 This text is designed for graduate-level courses in real analysis. This title is part of the Pearson Modern Classics series. Pearson Modern Classics are acclaimed titles at a value price. Please visit www.pearsonhighered.com/math-classics for a complete list of titles. Real Analysis, 4th Edition, covers the basic material that every graduate student should know in the classical theory of functions of a real variable, measure and integration theory, and some of the more important and elementary topics in general topology and normed linear space theory. This text assumes a general background in undergraduate mathematics and familiarity with the material covered in an undergraduate course on the fundamental concepts of analysis. Patrick Fitzpatrick of the University of Maryland—College Park spearheaded this revision of Halsey Royden’s classic text.